leave – nobody gets seasick! Our ship was scheduled to leave a bit later than most, but left a lot later than that. 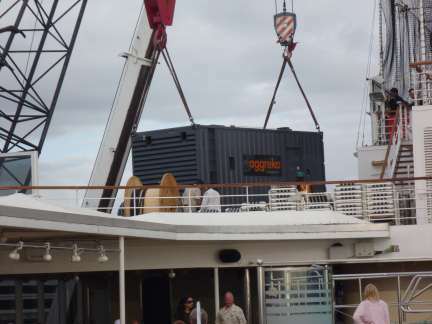 The backup generator did not pass the coast guard inspection upon returning to America from the Westerdam’s previous cruise in Europe. As fixing it would take several days, they brought in a temporary one and made modifications to place it on deck. The generator arrived on time. 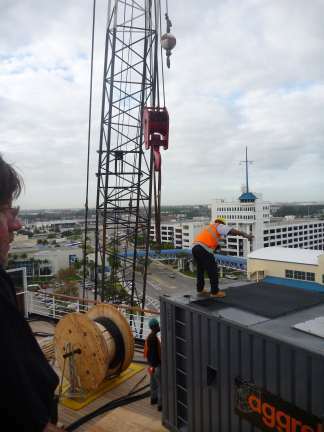 Problem was, the crane could not lift it. It took until the next morning to get a larger crane, so we had about a 16 hour delay before departing. One could have quite a nice vacation on a cruise ship without ever leaving the boat, in fact there are a number of people on board who do just that. 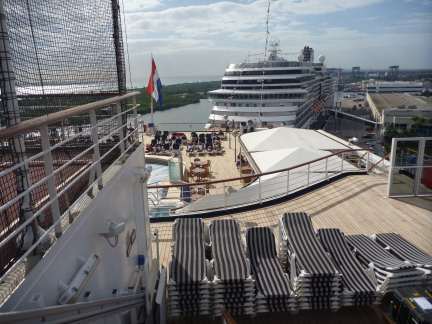 They enjoy having the ship to themselves while the majority of the guests explore the ports. Gamblers and shoppers are a bit lost for entertainment as the casino and stores close in port, but there are more shows, lectures, demonstrations, and of course food and bars than any one person could ever see, do, eat or drink. And the gym is open every day too. Somehow I just didn’t find time for the gym this cruise, except for signing up for a lecture during my initial explorations and putting in for a drawing for free spa services. We went to the drawing, but didn’t win. different slip at the port. The crane arrived and work began to lift the generator in place. Dodging the Tai Chi class and the people in the sports court, I managed to take a few pictures. I could see the new Royal Caribbean Allure of the Seas just behind us, preparing for her maiden voyage. We had breakfast in the Vista dining room, the only place to get the eggs benedict I have to have at least once on a cruise. We watched an endless sea of food go by, but seemed to have lost our waiter after he took our orders and served pastries. Eventually he found his way to our table and we enjoyed our food. Checking the daily schedule I found that the computer class I wanted to take started before the lecture I signed up for in the gym would end. Sigh, what to do? Not wanting to skip either, I tried to do both. 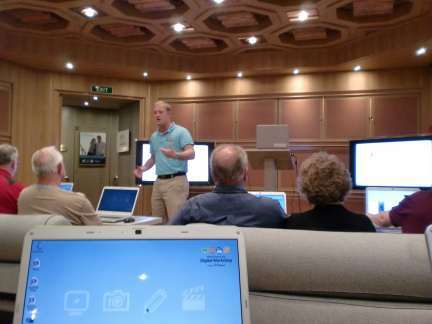 I sat near the back at the flat stomach lecture, planning to sneak out in time to go to the computer class. Meanwhile, John went to a cooking demonstration. While I was in the lecture, the captain made an announcement that we would not have time to go to Grand Turk, but would head straight to Puerto Rico once the ship got underway. As compensation for missing that port we were eventually offered a choice of 10% of that cruise or 20% off a future cruise. “Why don’t we just skip an at sea day?” I heard a person behind me ask. Perhaps a good plan if we could just beam the ship to Grand Turk Star Trek style. Maybe their brains were lost in space. I had wanted to try the power snorkel excursion offered at Grand Turk, but better to have an opportunity lost than to end up drifting at sea with no power like the Carnival Splendor. After a time, I checked my watch and knew I would have to leave if I wanted to get to the computer class on time. So I lost out on the end of the lecture. Only I couldn’t find the computer class. I had found the room the day before, but where did it go? After endless wanderings I finally found it. No sneaking in as the door was at the front of the room. And all the computers were full. “I’ll just zip up to my room and get my laptop then, is that OK?” I asked. It should have just taken a few minutes, but in my haste I forgot to check the signs by the elevator for fore and aft rooms. If you go the wrong way far enough then you go around a corner and end up on the odd numbered room hall instead of even. When in such a hurry that you have lost all major brain function, it takes awhile to catch on that no matter how many times you go up and down the hallway, the even-numbered room will never appear between any odd-numbered rooms. Oh yeah, other side. Finally, I got the computer. Now where was that classroom again? Not realizing yet that it was the old library, I couldn’t use the map or deck plans to find it as the computer workshop was not listed anywhere. More aimless wanderings. About halfway through the class I finally found it. Then I was really lost. Not only did I have no idea what they had learned so far, I did not have the same photo program. Trying to attend two things at once just doesn’t work. Make a choice and stick with it. I ended up taking the computer class again later. I took part 2 and realized I really needed all of part 1. After that I got there early enough to get a computer, but always had my laptop along just in case. 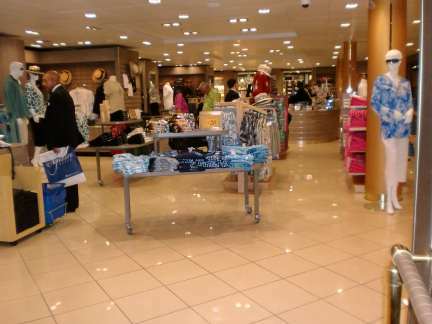 shops! Open!! That meant only one thing….. Finally the ship left port!!! I stopped to buy a sweatshirt since I had neglected to bring one. It did not take long to hit some relatively rough water. Walking a straight line became impossible as everyone staggered down the hallways like so many drunks. Some perhaps wished we had not left port after all. I took a Dramamine just in case, but did not feel seasick at all. The rough stretch only lasted a day or so before the water calmed down for the rest of the cruise. 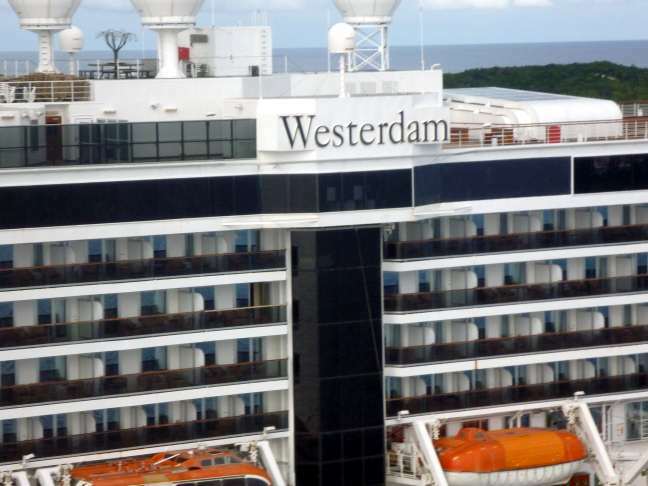 This entry was posted in Holland America, Randoms, Shipboard Life, Westerdam and tagged Caribbean, crane, cruise, Fort Lauderdale, generator, Microsoft Digital Workshop, Westerdam. Bookmark the permalink.